Vine videos are getting popular on the internet. Vine service is supported by Twitter that allows you to create short looping videos. You can make short videos of 6 seconds or less with sound using Vine App. Just like short text updates on Twitter or static photo updates on Instagram, Vine adds motion to your expressions through creative 6 seconds video creations. 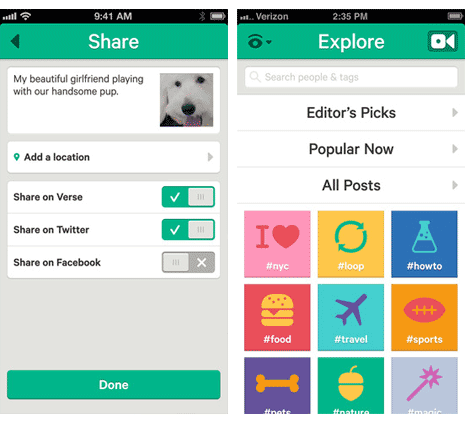 Vine is very easy to use service for creating short videos quickly on your mobile device. 1. To use this service, you need to download and install the Vine app from get.vine.co url (you will be redirected to Vine app page of iTunes store). As of now, Vine app is only available for: iPhone, iPad, iPod iOS devices. App version for Android, Windows Phone and BlackBerry may be in works. 2. Once you install this app on your Apple device, login using existing Twitter account or you can sign up using email address. After successful login, you can find people to follow and connect with other using address book listing, Twitter followers and Facebook friends. 3. Using camera on the mobile device and Vine app you can easily record short videos. To get started, tap the Video icon at top right. Then tap on the screen when you want to record. You can keep tapping back till your 6 seconds video is ready. 4. Once video is created, you can then share with friends on Twitter and Facebook. Please note, everything on Vine including profiles and videos is public as of now. Hence, anyone using the service can view every Vine video without any restriction. You can also visit Explore section to view Popular and Editor’s pick Vine videos. If you create a video using Vine app and do not share it – then that video will be privately available to you only within camera roll section on your device. With Vine you can capture life in motion – sort of Twitter in a video avatar. To see Vine videos in action, checkout Vine blog for selected few. You can also easily embed Vine videos on WordPress blogs. I am new in blogging line so just spending time researching and learning. I like your work alot. Hope to get your feedback and help, thanks.